The San Antonio Spurs dethroned Miami Heat to claim their 5th NBA Championship on Monday, June 16, 2014. Spurs avenged to deny Heat's 3-peat goal with a 104-87 victory that wrapped up the series in five games. 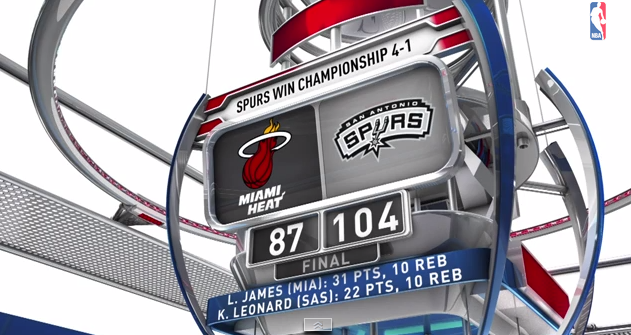 Spurs turned the rematch with the Miami Heat into no match at all. Kawhi Leonard was named the finals MVP with 22 points and 10 rebounds for the Spurs. 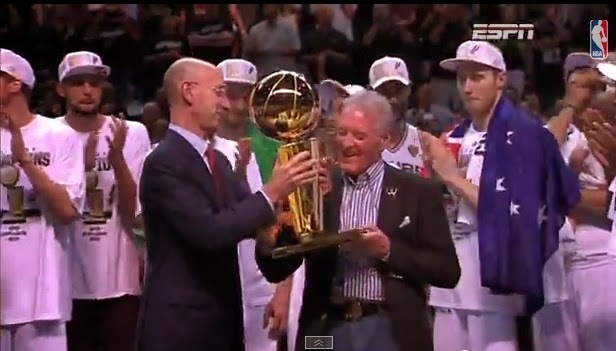 San Antonio added this title to the ones the Spurs won in 1999, 2003, '05 and '07. They nearly had another last year, but couldn't hold off the Heat and lost in seven games. LeBron James scored 17 first-quarter points to help the Heat get off to a fast start. But it wasn't enough. He finished with 31 points and 10 rebounds for the Heat, who lost their spot atop the NBA to the team that had it so long.